A Beginner’s Guide to Green Tea. Green tea is the least oxidized of all the tea categories. It can also be the trickiest to brew correctly. The most important factors to keep in mind are temperature and time. Green tea requires lower temperature water because too much heat can trigger the release of tannins, causing your brew to become bitter and unpalatable. Also, letting the leaves stay in the water for too long has a similar effect. Whether you choose a traditional eastern style or western method, knowing the basics will help you to find your way. Traditional methods used in China and Japan generally call for a larger amount of leaf, a smaller amount of water and short steep times. Vessels can be small glass pitchers or clay side-handled teapots but the basic principles are the same. The volume of leaf used can vary but a good rule of thumb is to cover at least the bottom of whatever vessel you are brewing in. The steaming process gives Japanese teas a more deeply vegetal taste so you’ll want to stick with temperatures between 140 and 175°F. Steep times are rarely longer than two minutes for these teas. 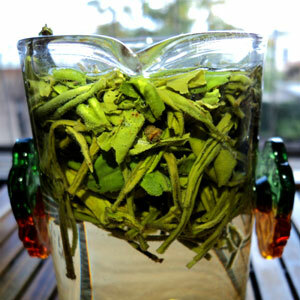 Chinese green teas aren’t quite as delicate so the recommended water temperatures will range from 170 to about 200°F. Steep times will stay around two to three minutes. Another option that is very popular in China is to drink your tea “grandpa” style. All you’ll need to do is use a bit less leaf and slightly lower temperature water. Fill a glass with water and use your teeth as a strainer. Just refill it as you go to avoid bitterness. The general rule for western style brewing is one teaspoon of leaves per cup of water. Your leaves should never be steeped longer than three or four minutes. It’s best to use teapots or cups that are made out of thinner mediums such as porcelain or fine ceramics. Thicker materials like cast iron will retain too much heat. You may also want to leave the lid off while steeping to avoid steaming the leaves. If making a single cup, open basket style steepers work best as these will allow your leaves to expand without restriction. Most importantly, there is no right or wrong way to make tea. What really matters most is that you enjoy the taste of what is in your cup.